The Fijian Ocean Ambassador program is designed to create young ambassadors for our ocean who will take Fiji’s future in the right direction, a direction where our oceans are healthy and debris free. 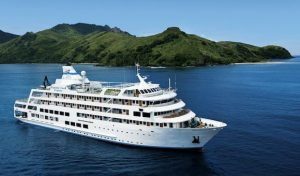 The program is a joint venture between Ocean Crusaders and Captain Cook Cruises Fiji. TRASH ART COMPETITION TO WIN A CRUISE!!! Students were asked to make a piece of art from marine debris. As the event unfolded, many made signs and posters with fantastic messages so we broadened the scope. A public vote was used to select 6 winners. Those six students will join Ocean Crusaders Founders Ian & Annika on a 4 day cruise on Captain Cook Cruises Fiji’s MV Reef Endeavour at the end of March to learn about how to look after our oceans and to ultimately become Ocean Ambassadors, teaching others of what they have learnt. You too can join the cruise and enjoy Fiji’s beauty and see how these students progress in their journey by booking now using this link. On Monday 4th March we will announce the winners of the competition. We had a staggering amount of votes and the winners are now listed below. Shortly we will announce the Ocean Ambassador Leader winners which are two lucky teachers who will also join us on the cruise as well, learning how to lead the Ocean Ambassadors into the future. NB: The 6 winners were chosen after a public vote. Whilst there were over 100,000 votes, we excluded all multiple votes from the same IP Address. The decision is final and no correspondence will be entered into. There will be 6 winners chosen from the competition. 3 males and 3 females. 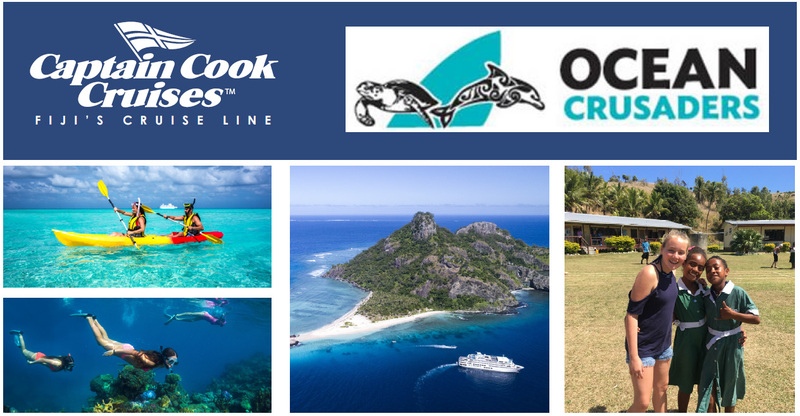 The 6 winners will go on a free 4 day cruise aboard Captain Cook Cruises Fiji’s MV Reef Endeavour departing Nadi on Tuesday 26th March through to Saturday 30th March. All meals will be included, hence no cost to you. You will be joined by Ocean Crusaders Founders Ian & Annika Thomson who will run you through a series of workshops as you explore the magnificent Yasawa Islands. You will learn about what the issues our reef are facing, how we can make a change to that and also how to teach others how to look after the oceans. You will go on beach clean ups, snorkel the reef to see what it is we are protecting and even visit a remote island school which you will have a chance to try out your newly learnt skills by teaching a class about what you have learnt. Students must have permission to go on the cruise from a parent or legal guardian, be able to make it to Port Denarau Marina by 1130 on the Tuesday and be picked up at 9am on the Saturday. Students will be supervised by Ian & Annika Thomson and 2 Ocean Ambassador leaders who will be chosen from Fijian Teachers who will apply for the roles via an application and interview process. We aim to make you Fiji’s Ocean Ambassadors. As ambassadors it will be your responsibility to lead the next generation of Fijian’s in looking after our oceans. Your voice may be small, however it will be heard by many. After the cruise you will have new skills to teach your fellow students on how to respect our ocean and how to look after it. We would envisage you also teaching your community by setting an example. Students must have consent of an adult to enter the competition. Students must have consent to attend the cruise and be able to get to and from Port Denarau Nadi. Students must make the art themselves. Student agree to abide by the rules and regulations of CCCF and OC at all times whilst on the cruise. Students agree to be on their best behavior at all times on the cruise. We are sharing the vessel with paying customers and hence no unruly behavior will be accepted. Winning students will be required to submit a parental consent form prior to the cruise.